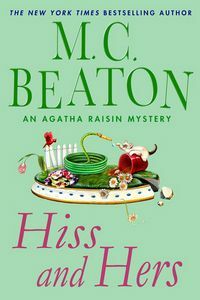 Hiss and Hers by M. C. Beaton: Synopsis and Online Purchase Options. Synopsis (from the publisher): Agatha Raisin is as feisty as ever — armed with her famous wit and biting sense of humor. This time, though, there's some biting of a whole other sort going on. Agatha has fallen head over heels in love — again. This time, she has her eye on the local gardener, George Marston, but so do other women in their little Cotswold village. Shamelessly determined, Agatha will do anything to get her man — including footing the bill for a charity ball just for the chance to dance with him. And then George doesn't even show up. Only partly deterred, Agatha goes looking for him, and finds his dead body in a compost heap. Murder is definitely afoot, but this killer chose no ordinary weapon: A poisonous snake delivered the fatal strike. Rising to the occasion, Agatha rallies her little detective agency to find the killer, only to learn that George had quite a complicated love life. But murderously complicated? Well, if she can't have George, at least Agatha can have the satisfaction of confronting the other women and solving the crime.